I was wondering about what sort of information people want to read so I check the stats of my site. Apparently “Dr Strange” + “Philosophy” ranks very highly in the search results. 😂 So people like their philosophy from films. Not surprisingly, the last article about financial advisory ranks pretty lowly. I could have put another title but it’s interesting to see the disinterest. Moana also got plenty of hits, same as 13th Warrior, possible some people got tricked into a financial website when they wanted entertainment. 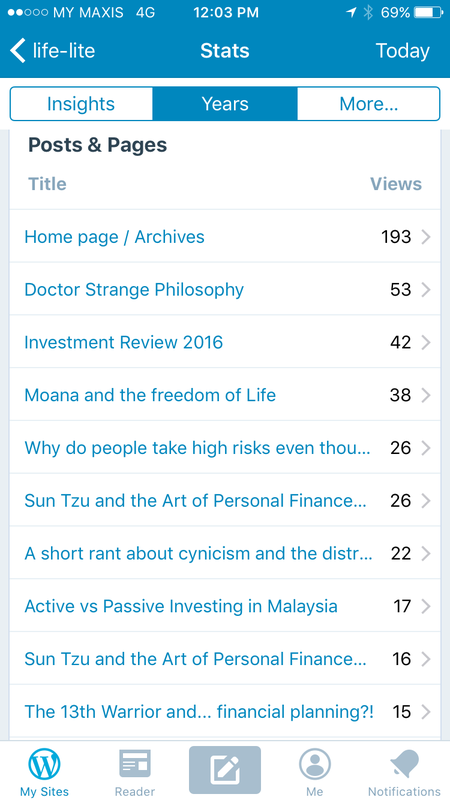 Lastly, to prove that people still like to grow their money, my annual Investment Review is also popular. In conclusion, perhaps next time I should write about financial things in the popular culture context more often. This is perfectly understandable as everyone relates to money matters in a personal manner. If we truly believe financial wellness is for everyone, then we will need to use more everyday language. ← What do Financial Advisors do?